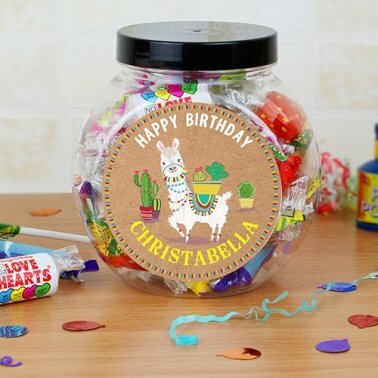 This Llama sweet jar is a perfect treat for any sweet lover. Personalise this sweet jar with any message at the top, up to 20 characters and any message at the bottom, up to 12 characters. Please note line 1 will appear as entered however line 2 is fixed uppercase. Personalised Gifts Reuires 2 - 3 Working days for delivery.